Original Thorens TD 125 MK II acrylic dust cover, perspex lid, excellent virtually unmarked condition. 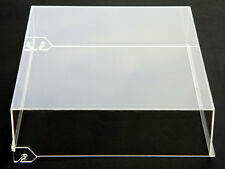 QDesignsGB 4mm clear acrylic dust cover for the TD 140 and 160 family of turntables. This dust cover allows the freedom to move away from the original MkI design and fit solid sturdy hinges as listed above. Thorens TD 145 160 165 166 Haube Deckel Dust Cover Turntable MADE IN GERMANY !!! This new high-quality acrylic cover is suitable for the Thorens TD 145, 160, 165, 166 turntables. This is a replica of the cover - not an original. PatheWings Dust Cover PW-TD 60. Our product is known by: MONO AND STEREO. Thorens TD 126 TD126 Haube Deckel Dust Cover Turntable TOP ! MADE IN GERMANY ! This new high-quality acrylic cover is suitable for the Thorens TD 126 turntables. This is a replica of the cover - not an original. PatheWings Dust Cover PW-TD 26. Material : 3 mm Acrylic polished glass. Thorens TD 150 TD 150 Mk2 Plattenspieler Haube Deckel Dust Cover Turntable TOP ! This new high-quality acrylic cover is suitable for the Thorens TD 150 turntables, both the TD 150 as well as the MK II. This is a replica of the cover - not an original. PatheWings Dust Cover PW-TD 50. This new high-quality acrylic cover is suitable for the Thorens TD 145 MK II, TD 160 MK II, TD 160 B MK II, TD 165 MK II and TD 166 MK II. This is a replica of the cover - not an original. PatheWings Dust Cover PW-TD 60 MK II. This has the cutouts on the rear and is designed for use with Linn LP12 hinges as seen in the later pictures (although other hinges such as Pioneer PL12 hinges may work?). Included with this dust cover are 4mm shims that are required to centre the dust cover on the standard Thorens plinth providing a flush fit on the front and sides. This has the cutouts on the rear and is designed for use with Linn LP12 hinges as seen in the later pictures (although other hinges such as Pioneer PL12 hinges may work?). 435mm x 345mm. Included with this dust cover are 4mm shims that are required to centre the dust cover on the standard Thorens plinth providing a flush fit on the front and sides.